Naginoha Gozen in some accounts is the younger sister of Suketsune and is therefore related to the Soga brothers' revenge plays. Other sources generally list her as Suketsune's wife. Her name is sometimes printed as '梛葉'. 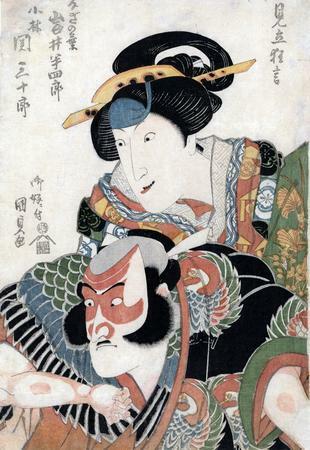 There were a number of 18th century kabuki plays centered around Naginoha: Naginoha Asahi Genji and Naginoha Izu no Sugatami. There is a small black and white reproduction of this image on page 334 of Masterful Illustrations: Japanese Prints in the Anne van Biema Collection.